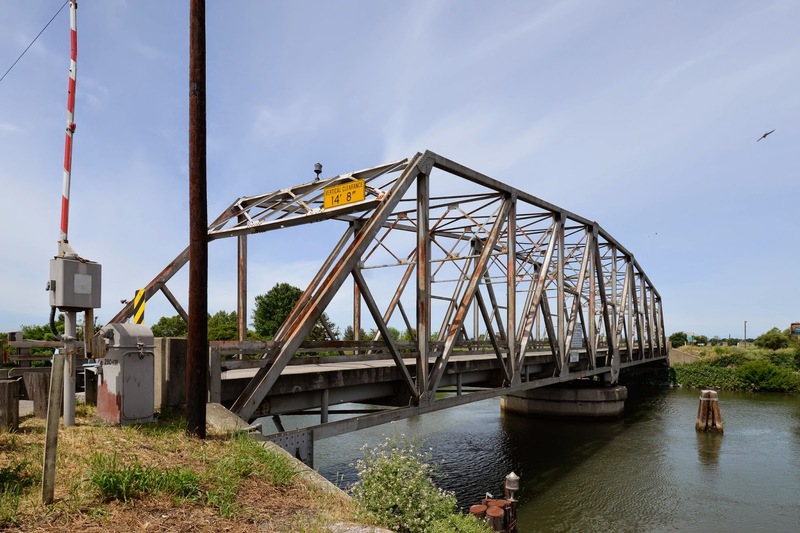 The Mokelumne River (Millers Ferry) Bridge (29C0131) is a two span steel through girder riveted truss swing bridge built in 1955. It's 238ft long, 24 ft wide, and with 14' 8" of vertical clearance below the portal frame. Millers Ferry must have provided access to the far bank before the bridge was built. The bridge operator's house sits on the side of the road within sight of the bridge but without a good view of the river. The bridge is on the border between San Joaquin and Sacramento Counties. San Joaquin County, California Bridges: Millers Crossing Bridge across the Mokelumne River by Mark Yashinsky is licensed under a Creative Commons Attribution-NonCommercial-NoDerivatives 4.0 International License.